When I upgraded to the Torch, one of the first things I noticed was that the native Calendar icon displayed a date that was automatically updated. True, you can also see the date without the icon, but it’s just one of those add-ons that you have to assume somebody asked for. To whoever had that brainchild, I salute you. There are a few OS 6 type themes out there that try to capture the look and feel of OS 6, but there was one thing that they missed - that auto-updating Calendar icon. BlingBerry themes noticed that too and they decided to do something about it. For those who want to add a bit of functionality to your calendar, they present RealCal. 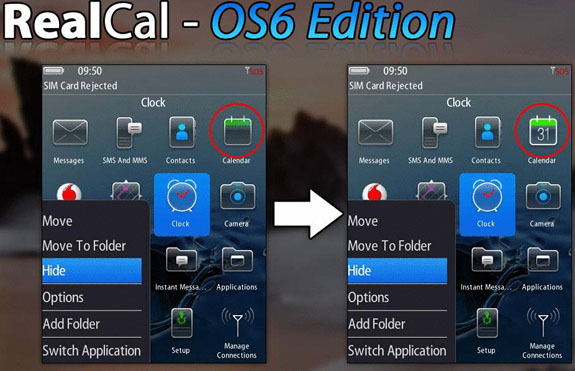 They’ve really nailed the appearance of the actual OS 6 calendar icon; they say they’ve actually sourced the graphics directly from OS6 BlackBerrys. Not leaving OS 5 fans behind, they also added the same functionality to an icon that fits it with the default Precision Zen theme. The icons blend in perfectly. So while you wait until OS 6 arrives, you can get a jump on the OS 6 calendar icon offering. Easy to set up. Just install and it automatically turns your original calendar icon into an updating one. No additional setup is required. Reliable and light weight. We keep the file size low and the memory usage to a minimum. We're talking true native application performance. RIM couldn't have done it better themselves if they tried. Real OS5 and OS6 graphics. Everything is sourced directly from your device and looks completely authentic. The last missing piece for your favorite OS6 theme. Get that blank or static calendar icon updating to bring your device to life! RealCal is currently supports OS 5.0 and is compatible with the Curve 8900, 8500, 9300, the Tour, Storm, Storm 2, Bold 9700, 9650. RealCal is currently on sale for $1.49 in the CrackBerry App Store.